This guide will give you basic advice on how to layout and install Zigzag engineered parquet blocks in a herringbone pattern. It is important to first read and understand the Hardwood Flooring Installation guide at www.v4woodflooring.co.uk/support. V4 Zigzag is a bevel edged engineered parquet block which does not require sanding and filling like traditional solid parquet blocks. Once the sub floor has been correctly prepared and is fully level, dry and primed, Zigzag can be installed using the correct flooring adhesive. We recommend Wood’s Good MS Plus Adhesive which provides excellent grab and is fully tested with Zigzag. Zigzag can be installed in many different patterns as the blocks are universal(not left and right) as they have one tongue and 3 grooves. Please note that some patterns will require false tongues to ensure a stable installation. For Herringbone styles where the blocks overlap side and header joints, false tongues are not required. It is important to be precise with a herringbone installation so ensuring the first row is correctly positioned and square is key. The following method makes layout simple using a perfect square template to set the first row. 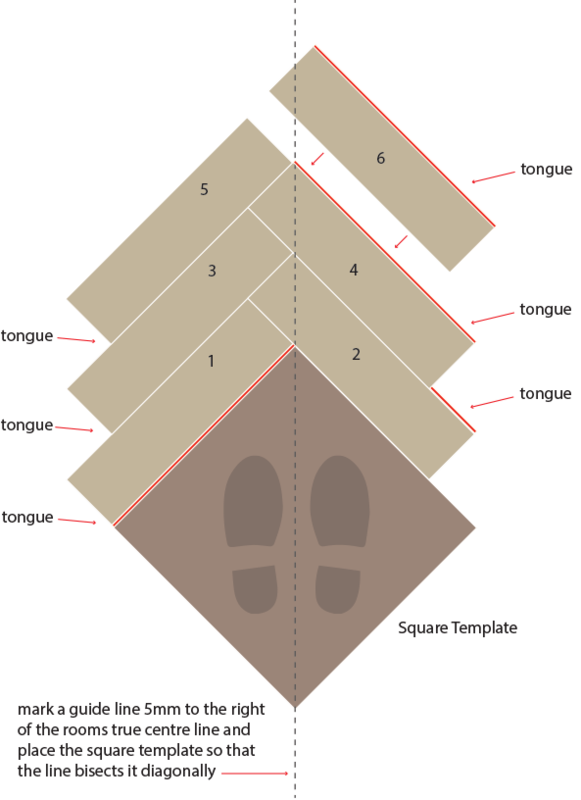 Ensure the square template is screwed to the subfloor so it can be easily removed once the first row is set. Once correctly positioned the square template will give a solid start point making it easier to move the blocks into position without gaps opening up. 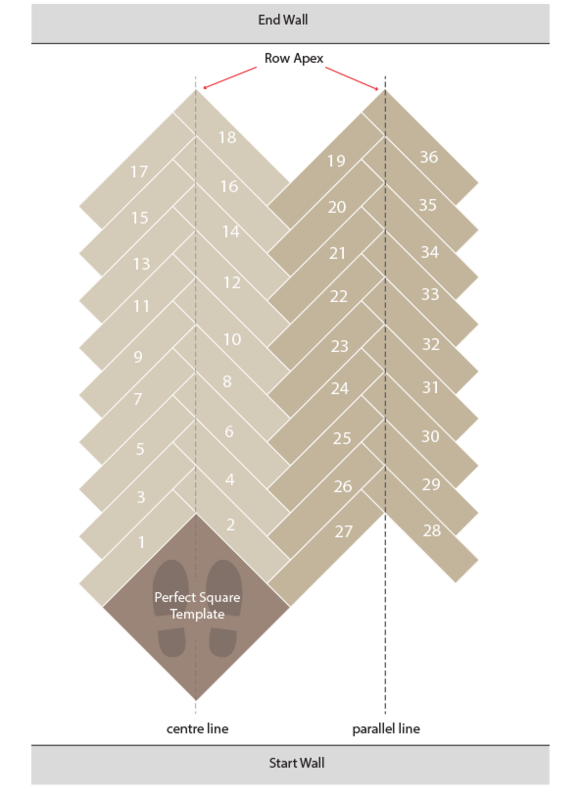 Plan the direction of the herringbone pattern, usually this will follow the length of the room. Find the centre of the room and use a plumb line to mark out a centre line. The apex of the first row of blocks will run along this line. Note: If the centre line is used to align the square template then the row apex will be offset by the depth of the tongue which is approximately 5 mm. If total accuracy is required then first find the room’s centre line and then mark an offset guide line 5 mm to it’s right and use this line to place the square template. The template should have sides equal to, or greater than the length of the blocks. Starting close to the wall place the square template so that the offset guide line bisects square diagonally from opposite angles. Once positioned screw the template to the subfloor. Working from this template will ensure the first row’s apex follows the centre line. Place block 2 with tongue facing away so that the grooved edge is pressed against both the header joint of block 1 and the righthand side of the square template. Repeat points 6 & 7 placing blocks onto the bed of adhesive ensuring that they connect, the leading corner of the herringbone pattern should be positioned over the centre line which is 5 mm left of the guide line. Tip: Use a hammer and tapping block to push the blocks together, occasionally lift a block and check the adhesive has full coverage. Once the first row has reached the opposite end of the room or the finish point, use a tapping block and hammer to make any adjustments while the adhesive is still wet and remove any adhesive which has not been covered. Important Tip: Remove any adhesive spills from the face of the blocks while it is wet with a damp cloth before the adhesive sets. Allow the adhesive to fully cure and this row will form a fixed point template for subsequent rows. Working off the first row, loose lay the second row placing checking that that the apex of the second row is parallel to the centre line. Once you are happy to install, apply adhesive to the area adjacent to the first row. Starting at the ‘End Wall’, install the first half of the second row in two halves. The first block(19) should be placed so that the long grooved edge is pressed against the header joint from the last block in the first row (18) and the header joint groove connects with the next section of exposed tongue the next block(16) in the first row. Repeat this process with the first half the second row until the square template is reached. Repeat this process to fill both sides of the first row cutting blocks to fit the perimeter of the room so that adequate expansion gap is maintained which can then be covered by skirting or moulding. A border may be installed using a plunge saw to cut away the blocks to make the required space. A groove can then be machined into the cut edge so that blocks can be joined.